Mimaki Engineering Co., Ltd. (President: Mikio Noguchi; Headquarters: Nagano, Japan), will participate in “drupa 2012” (Global printing equipment exhibition held from May 3 to 16, 2012 in Dusseldorf, Germany) jointly with Mimaki Europe B.V. and Mimaki-nbn GmbH. Mimaki group, as an innovator, proposing “Originality and difference”, is working for product development that is unique and contributes customer’s benefit. Our main theme of drupa 2012 is “World imagines, Mimaki delivers”. Not only demonstration and proposal of existing products is performed but also reference exhibition of the next generation products that carve out a new future will be on display to create and deliver the “Products of Dreams” that every customer in the world would imagine. We will be delighted to see you at drupa 2012 Booth Hall 9 Stand C21. Printing material and jigs can be engraved by a laser engraving machine and full color printing is performed. Equipped with newly-developed print heads, high speed printing has been achieved. In 4-color mode the JFX500 can achieve up to 60 m2/h and printing with white ink up to 50 m2/h is possible. Equipped with a newly developed UV-LED curing unit, whose ink curing-efficiency has substantially been improved, high speed printing is now possible without leaving uncured ink behind. Mimaki’s unique head control technology has achieved highly detailed printing which even enables printing of 2 pt characters. Beautiful gradations using variable dots, which enable better printing results with reduced granular appearance can be achieved. 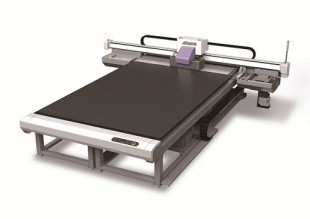 Equipped with a large-sized flatbed (2,100mm x 3,100mm), direct printing on a great range of materials with a height of up to 100 mm is now possible. Either hard or flexible ink can be selected to cater to your needs. Great cost reductions have been achieved by supplying our Mimaki inks in 2L ink bottles. Environmentally-friendly, energy-saving, longer lasting LEDs are used. Almost no VOCs are generated by UV curing printing. Larger sized substrates for more efficient printing. * Since this model is still under development and exhibited just for reference, its features, specifications, etc. may be subject to change without notice. When using a flatbed printer, strict accuracy is required for its alignment. Adjusting such alignment by millimeters has been pretty annoying. “Easy Direct Print System” reads the misalignment of jig by its dedicated camera equipped in the printer and automatically adjusts the misalignment with dedicated software (a plug-in for Raster Link 6). Since printing data is automatically adjusted against the set jig even if the setting was roughly implemented, accurate print results are achieved. * The dedicated camera reads markings located at the four corners of the jig. * This system is exhibited for reference installed on UJF-3042HG. ・	The dedicated camera can read misalignment of the jig. ・	Plug-in software for Raster Link 6 can automatically adjust misalignment. ・	Alignment of jig which has been demanding and annoying is not needed anymore. ・	Automatic adjustment by software enables more accurate alignment therefore enhancing productivity. ・	Dedicated software Plug-in for Raster Link 6, which is a software RIP for output of Mimaki’s printers. The UJF-3042HG prints the full color image on precut acrylic workpieces in accordance with the shape and position of those materials. Printing jig is simultaneously created while printing workpieces are cut by a laser engraving machine. 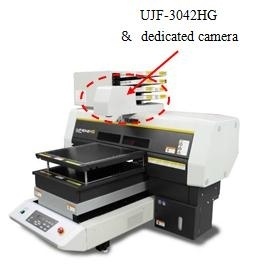 Therefore, if you already have the laser engraving machine, you only need to install the UJF-3042HG printer for expanding your business opportunities. Furthermore, we offer “doming” that is a process of applying resin liquid onto the surface of printed material with a thick layer and adds the printed materials more values and durability. A demonstration is performed to show manufacturing of window graphics using the world’s first white latex ink (only offered by Mimaki) and poster printing using 4-color (CMYK) will be demonstrated. The media to be used is not the one dedicated to inkjet printers but ordinary transparent film or paper. You can be assured of high versatility of our white latex ink. Mimaki can print on uncoated substrates with our new JV400LX printers. Mimaki continues to make new advances and developments in the sign graphics industry, and is proud to unveil a new standard for sign manufacturers; Solvent UV. Never-before-seen glossiness and scratch resistance that everyone desires have both been achieved. 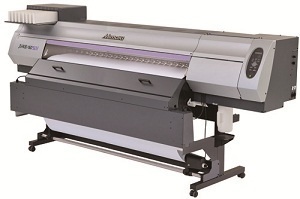 Mimaki’s original solvent UV ink enables unprecedented sign manufacturing. 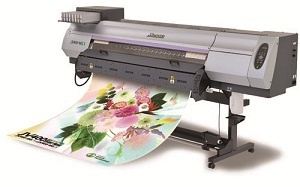 Mimaki is a leading manufacturer of wide-format inkjet printers and cutting machines for the sign/graphics, industrial and textile/apparel markets. Mimaki develops the complete product range for each group; hardware, software and the associated consumable items, such as inks and cutting blades. Mimaki excels in offering innovative, high quality and high reliability products, based upon its aqueous, solvent and UV-curable inkjet technology. In order to meet a wide range of applications in the market, Mimaki pursues the development of advanced on-demand digital printing solutions. Mimaki Engineering Co. Ltd., (President: Mikio Noguchi) Nagano (Japan), is publicly listed on the JASDAQ Securities Exchange, Inc.